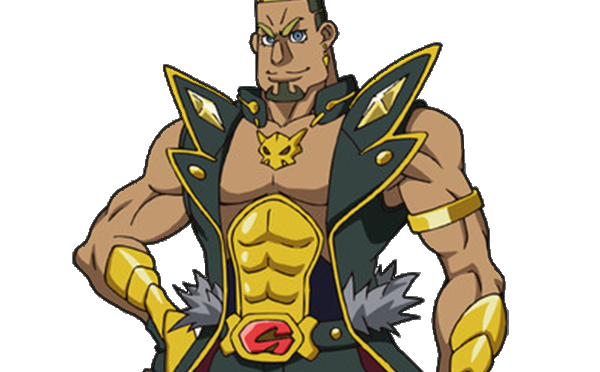 Gō Onizuka is a character appearing in the Yu-Gi-Oh! VRAINS anime. He is a Charisma Duelist. “Onizuka” (鬼塚) is written with the characters of “ogre” and “mound”. “Go” (豪) can be translated as “strong” or “manly”. The muscular man is decked out in intense armor and has on green-and-purple trousers. His look is completed by gold accessories and an arm brace, but fans aren’t quite sure where his loyalties will stand. While the character does look a bit intimidating, Gō could very easily put himself in Fujiki’s corner. Gō Onizuka uses a “Gouki” Deck that incorporates Link Summoning.